The velocity of the water can have both positive and and negative effects. Quickly flowing water can help flush waterways and prevent bacteria from growing as quickly, but it can also harm sensitive organisms that cling to rock faces. Elevation can have both positive and negative effects as well. Higher streams are cooler and this supports the populations of brook trout, but the trees and ecosystems located higher up are the first recipients of acid rain. I made the image above one evening after climbing partway down a very steep bank. The water was stunning as it found its path through the rocks. But as I peeked through the branches to watch, I couldn't help fearing for the fragility of these ecosystems that have endured for hundreds of millions of years until we arrived and altered the balance from afar by burning fossil fuels. Most of the stream was quite shallow, but here, just beyond a bridge over the stream, the water was very deep and we were able to take a dip the next day. The water was still frigid, which was a good thing for the fly fisherman that are drawn to this area and for the brook trout that live in this stream. 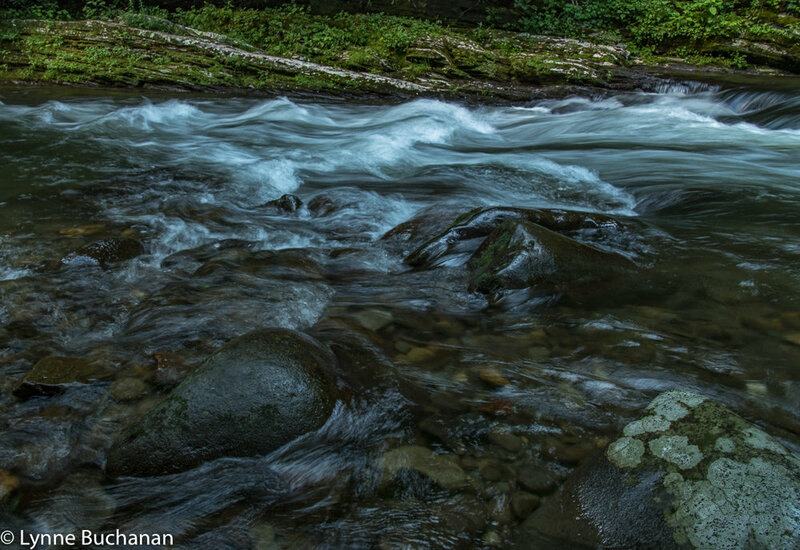 As temperatures increase from climate change, it will alter the levels of dissolved oxygen, which will damage the gills and reproduction systems of the trout. 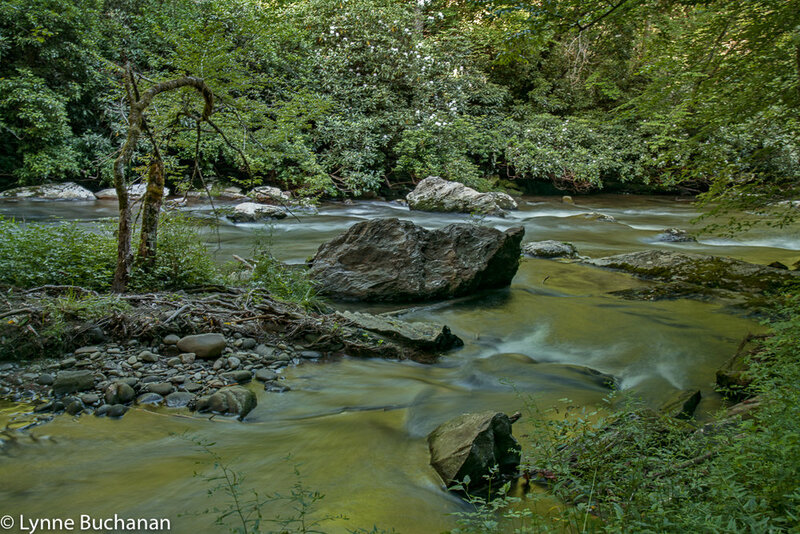 For now the many visitors to Deep Creek can still enjoy this pristine stream and in the evening when everyone has gone home or back to their campsites, it is incredibly tranquil. In fact, it was so peaceful it was hard to drag myself away and my friends were close to calling out a search party, Below are some more images I made during this visit. The mountain laurel was in full bloom, which was a treat to see. Below are two black and white images from my visit. The first is of ledges along Deep Creek midway down the stream and the second if of Indian Falls, a waterfall along Indian Creek just before it merges with Deep Creek. I also hiked the trails through the woods along Indian Creek and back up through the hills until it rejoined the Deep Creek Trails. I saw some interesting fungi along the way, and at the top of the ridge where two trails met, I was met by a curious deer. We sat and looked into each other's eyes for several moments. I took one photo with the camera I had in hand, but then I put it down since I had this feeling that I wanted to connect with the deer instead of frighten it. The deer then walked through the woods quite near me and appeared on the other trail, pausing again to look at me. Slowly, I made a second image, though I felt weird pointing my camera at it when the deer was allowing itself to be vulnerable. I would clearly not make a good hunter. Even taking photographs felt intrusive, so I only made these two. I used to live in Westchester, where deer almost seemed to outnumber people, and they were quite brazen and typically seemed unconcerned with people. But I am used to wild deer running off, so this encounter felt special.